It is that much sweeter when you build a home as opposed to just moving into one. 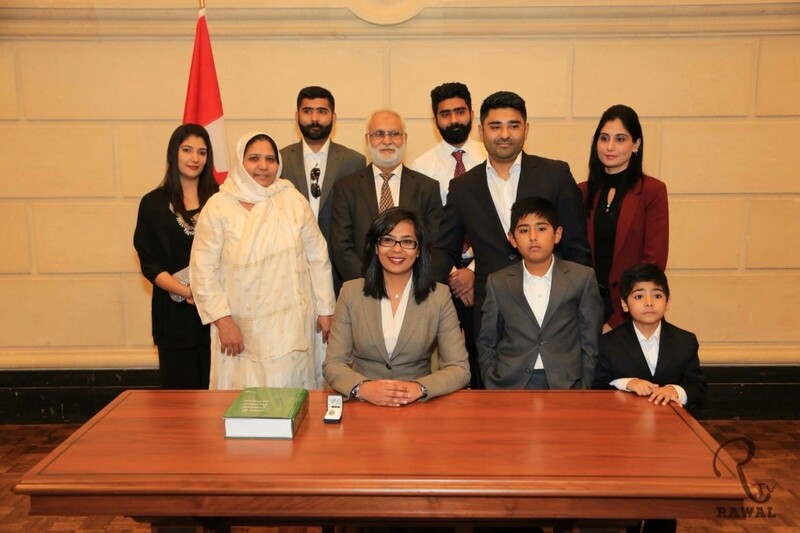 A force for change, newly elected MP Iqra Khalid did not let institutional barriers prevent her from being elected to represent Mississauga Erin Mills in Parliament. Rather she used these things to allow her to better understand and connect with her constituents. Khalid is an avid believer in Prime Minister Trudeau’s saying, “Canada is strong not in spite of our differences, but because of them.” On the evening of October 19, after becoming the MP-Elect, her first tweet was directed to her NDP opposition Michelle Bilek saying, “Thanks and congratulations to @mbilek for running a great campaign! I look forward to working with you to make Erin Mills even better!” Additionally, she was kind enough to sit down with me for an interview with the The Link Canada to discuss her story — and what she has done to make it all the way to Canada’s Parliament. 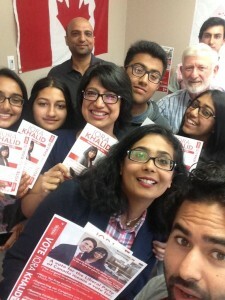 Iqra Khalid’s unequivocal drive, as well as her willingness to help others makes her an ideal representative for the people of Mississauga Erin Mills. 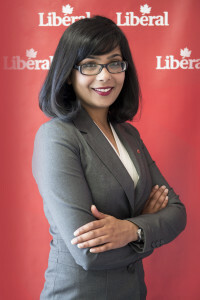 As a young professional, a woman, and a visible minority, Iqra Khalid has already inspired so many people to embrace their identity and to use it to connect with people positively. 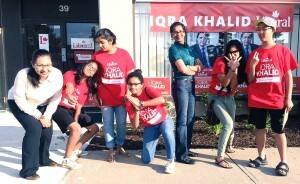 So, who is Iqra Khalid? Tell me more about yourself. Iqra Khalid (IK): She’s your average girl. She’s a young professional, a coloured woman, a Muslim and someone who cares about where Canada is going. My family and I immigrated to Canada in 1998 and I’ve been working since I was 14 years old. We worked from the bottom up. When we first came here we shared a one bedroom apartment between my parents, my three brothers and me. One thing I’m grateful for is that my parents never differentiated between my brothers and me. That played a big role in who I turned out to be. It redefined what boundaries we create for ourselves based on gender. In the political world and in the corporate world it’s something I had to battle with. I think that had a lot to add to who I am today. What other kinds of work and volunteering did you do when you were first starting off? IK: My first job was in a shoe store and from then on, I worked for my parents and I started my own business when I was 16. I used to do henna tattoos and would take the bus to wherever the party was going on that night. Once we moved to Mississauga and I started university I did a lot of extracurricular activities. I started off as the Event Coordinator for the Pakistani Students Association, then became Vice-President and then President. I was also an ambassador for the University so I represented the student body at corporate events. There was an initiative I took with other schoolmates to start a dialogue between the Jewish and Muslim students on campus. We held events to talk about Islamophobia and build relationships with our Jewish friends on campus. How has your family influenced the way that you were brought up? IK: My mom didn’t make it past high school and my dad has a PhD. You can think about the different roles I see of the people I look up to most. My father is very much an intellectual visionary and my mom is basically the hard work behind it all. My father was offered an opportunity to go to the UK to get his Ph.D. He decided to take it and we moved to the UK when I was six. After he completed his Ph.D. we went back to Pakistan and applied for immigration to Canada. While here, he was not able to find a job in his field due to a lack of Canadian experience. His degree was not recognized so my family and I really worked together to make a living until we started a business. I really think our family unit is, Alhamdulillah (Praise be to God), very strong. Something that my parents have always taught me, is the value of effort. My dad always said it’s up to us to give our best effort, the rest is really up to God, and that’s what my brothers and I have grown up doing. We have worked so hard and it makes it that much sweeter when you build a home as opposed to just moving into one. I’m really connected to my country. So what initially sparked your interest in politics and why did you decide to run? IK: That’s a very good question and you’re probably the millionth person to have asked me! -laughs- To be honest, it just seemed right. When the opportunity arose, we had a dinner conversation which is the norm when making important decisions in my family. When I approached my family about running, nobody hesitated. It was a very natural decision. I had a gut feeling. Jean Augustine said it best when she said, “there’s a fire in my belly.” It’s that fire that really drives me to do what I’m doing. I really feel I can provide representation for the people I can really relate to and when I say relate to I am talking about the youth, the women, the people of colour. I feel like I really understand. I have a lot more to learn but the fundamental understanding is there. What would you say is the most enjoyable part of your campaign? IK: It was bringing people together and achieving something together. Everybody really did come together in the last weeks of the campaign. Three days before the election, we were putting together poll kits and I had just gotten back from a canvass. I walked into the office – which was only 1000-1600 square feet – and there were about 45-50 people sitting everywhere. People were sitting in full circles, together. Elderly, children, families, people from all different backgrounds, they were all sitting there working towards one goal. I almost cried when I saw that scene, I cannot tell you how much that really moved me. It took us almost two years to get to that point and seeing that made me believe we were on the right path and doing the right thing. What does this mean for Muslims in Canada now that we have nearly a dozen Muslims elected in the Federal Government? IK: And one as a minister, and she’s a woman on top of it! I think it’s a very positive image. It’s a good feeling and it’s important to keep in mind that these people represent us but they also represent Canadians of their constituency. It’s a very positive step forward. The Conservatives ran a very divisive campaign, and if Canadians really bought into it, it would not fare well with these candidates. It really shows that Canadians are better than that. We are inclusive. It’s not just Muslims, there’s Sikhs, there’s people from all across the world that sit on our Parliament now. What I want to say is that it’s a good on Canada for doing so. Do you think that Muslims in Canada should be more civically engaged and why? IK: Of course. There exists a problem globally with respect to Islamic extremism and I think that having real representation in Parliament and in other public offices, really would be a more positive picture of Muslims and what we really are, what the majority of Muslims really are. Yes, we have special needs or concerns that other communities might not necessarily have and they might have concerns that we may not have. The idea is about effective representation. We are a country that is made up of minorities, and Muslims are a huge part of that. It makes sense to have that representation and I think it’s a positive step forward. I think that a lot can be done to eradicate the propaganda that has been spread over the past 10 years. The fact that the niqab became an issue in the election made no sense to me whatsoever. We have a Charter of Rights and Freedoms guaranteeing our freedom to practice our religion for a reason. How has life been different from Election Day until now? At the end of the four years what would you constitute as a successful term? IK: Now the work is starting. I feel a great sense of responsibility to those people who are bringing their matters to me it really humbles me that I’m in a position now to really provide that help to people — and I hope I can live up to the expectations. I feel very responsible and very eager to get started with this already. I really hope that I open the doors for other people like myself. To do better, to not let barriers stop them from doing things that they want to do. I was at an event before the election and I didn’t know many people there. There were 3 girls, very young, maybe in their late teens. They came up to me and they said “Hey are you Iqra Khalid?” and I said “Yes, what did I do now?” -laughs- They said, “We really look up to you because you’re showing us that we can do it too. You’re not letting any of these factors get in your way to achieve what you want.” I can only hope that I can maintain that, and to really provide that mentorship role for our youth. What would you say is the best way to connect young people with the political process? IK: I think we need to really reach out and do things to engage them. In the early days of the summer we reached out to high school students and had a few young kids come forward who were looking for high school hours. They came in and we really engaged them by teaching them about the civic process. We made it fun for them, and it was to the point where these youth they took initiative and they created a ‘Young Liberals’ club on their own. By the end of it, they were there, holding my hand on election night while we were cheering for our victory. One of the boys called me up the next day and he says, “Ok Iqra, now that we’ve won the election…what do we do now?” So I really feel that when you engage and invest in people, when you ask for their input, when you show them why it matters I think that people really understand the value of their engagement. The youth have so many intelligent things to say. We have a lot to learn from them. One thing I’m committed to is setting up youth committees to really engage the youth of Erin Mills on different social issues. I really think that through youth involvement and by seeking their advice and their input we can engage them even further. IK: I paint. I do acrylic on canvas; I had started experimenting with oil paints before the whole campaign started. But I haven’t painted in a while. I hope I can make time to do it soon. My last painting is that of a peacock and it’s very unfinished. I hope that I can finish it sometime in the near future. I also play squash in my spare time. What is your favourite traditional food? IK: Chana palao with tandoori chicken. I’m actually a pretty good cook. Before I went off to work for the immigration firm I used to cook at my parents business. We have a catering operation — so I’ve cooked for up to 700 people. Who would you say has been your biggest inspiration throughout this journey? IK: My mom and dad. Always. They’ve been my rock in my soft place. They’ve been there in my tough times and guided me, they’ve advised me, they’ve struggled for me, they’ve gone sleepless nights by my side and they have shown me what commitment means. They’ve shown me what hard work means. I don’t think that I would be anywhere without them. 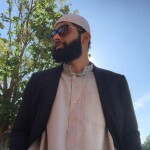 Azeem Patel is a Police Cadet with Hamilton Police and the Youth Services Director at the Muslim Association of Hamilton. He completed his Bachelor of Arts at McMaster University in Honours Political Science & Peace Studies where he was President of the McMaster Young Liberals. He enjoys basketball, men's fashion, and all things peanut butter.